On the last day of January, as another Maryland hunting season came to a close, being a passionate wildlife manager I found myself anxiously awaiting the final test of Patriot LWM management strategies. Thorough analysis of hunter harvest records and observation logs is what drives our measure of success or failure, and what guides our management objectives for the following year. Although hunters under Patriot management must log harvests into our online database within 24 hours, the laundry list of other tasks to accomplish during the season does not afford us the opportunity to really look deeply into the numbers. Each aspect of the biological data collected could be a blog entry in and of itself (hint: each may very well be in the future) used to discuss the importance of the measurement and what it is telling the wildlife manager. For the purpose of this blog entry, I only wish to present the case study of the Patriot Land and Wildlife 2010-2011 management season and allow readers to begin to see how the data collection relates to measures of a management program. Patriot LWM organizes, qualifies and provides oversight for a volunteer hunting group known as the Patriot Whitetail Removal Team (PWRT) for use with large or small scale management efforts on properties that demand both discretion and production. Patriot LWM also provides hunter management for our recreational leasing and property management clients to insure their wildlife management programs are carried out in conjunction with the recreational enjoyment of the land. Patriot utilizes the principles of Quality Deer Management to educate it’s hunters in deer biology and administer harvest quotas and techniques to be carried out by both sets of hunters. The total management area for Patriot LWM was 5000 acres. PWRT and Lease Members harvested a total of 345 deer on that acreage. The PWRT accounted for 220 of those 345 deer. 96% of the total harvest were does (females), 3% were button bucks (.5 year old males) and less than 1% of the total harvest were Bucks. Of the 7 button bucks killed, many were the result of late season body size increases which made them mistakenly targeted for harvest as does. 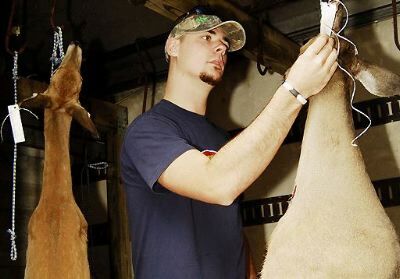 Of the 2 bucks that were harvested, one was a 3.5 year old buck with only ¼” small velvet nubs where antlers should have grown, again causing this buck to be targeted as a doe. The other was a 4.5 year old mature buck with an antler score of 149 total inches, 7th largest crossbow harvest in Maryland ever, obviously meeting our ideal harvest standards. PWRT members averaged 1 deer harvest for every 2.5 hours spent in the treestand which is a testimate to both their hunting ability as well as their maximization of the effort vs. result equation (the manner in which effort is applied has a direct correlation to the result realized). Most female deer possess reproductive potential by 1.5 years of age, with older deer accounting for the highest reproductive potential, often bearing twins and in some cases triplets. Therefore the targeting of this upper age structure in a population will further expand on this effort vs. result scenario. Harvesting 3 deer of lower reproductive potential is not as effective as harvesting 3 deer with a high reproductive potential, although the exact same amount of effort is expended in both cases. 62% of the 220 deer harvested by PWRT were 2.5 years old or older, 23 % were 1.5 years old and only 15% of the total harvest were less than 1.5 years of age. According to the Maryland Annual Deer Report, during the 2009-2010 season, 66% of the total state hunter harvest were antlerless (deer without antlers) and 34% were antlered bucks. When you factor in the total number of button bucks (male antlerless) that were recorded during this time, the actual female deer harvest is 52%, with males making up the other 48%. These numbers are a far cry from the above 96% needed to realize a population reduction as is recommended by many State wildlife managers. Although not quite as precise, a similar situation unfolded on recreational leases under Patriot LWM oversight. 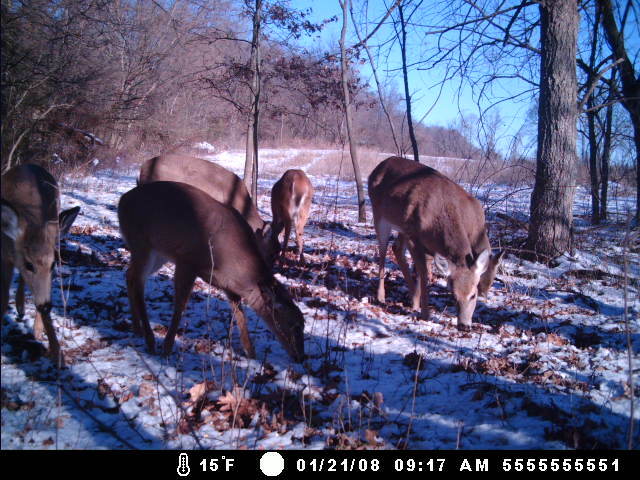 Lease members accounted for 125 total deer harvested, 89% were does, 8% bucks and 3% were button bucks. Of the 10 bucks killed, 4 were harvested due to the fact they had been severely wounded on adjacent properties and needed to be put down out of proper ethics. 3 bucks were harvested by youth hunters (16 years or under) and 3 were harvested as meeting the mature buck requirements. Measuring the reproductive potential of a population is an inexact science; many factors weigh into the debate including herd health, climate, weather conditions, predators etc. For demonstration purposes we will only make a few assumptions so that readers can better visualize how specific harvest requirements weigh in to the effort vs. result we talked about. If we assume that based on our age structure, some deer would have had triplets, some twins, others 1 or none at all, the following are an example as if the reproductive aged does would have had twins. The combined harvest of these 345 deer, plus their reproductive potential which was not realized accounts for up to 989 deer that will not be there in the spring of 2011 to feast on agricultural crops, landscapes or ground nesting bird habitat. An adult deer consumes on average 1.5 tons of forage a year, so 345 deer harvested immediately results in 517.5 tons saved and up to 1483.5 tons saved for 2011. In later blog entries we will take a look at specific results as they relate to agricultural yield data and economic relationships to effective deer management, stay tuned!